We didn't like using plastic wrap or zip bags to keep food fresh so we made these clever beeswax food wraps as an alternative to plastic. We love using them, so do our friends and family and we think you will too. Bee Clever all natural beeswax food wraps are 100% cotton infused with pure locally sourced beeswax from happy, healthy bees. Each wrap is individually handcrafted in the Lockyer Valley, and designed to keep food fresh without plastic wrap - how good is that. We started making them for our own use as we were fed up with plastic wrap. Such a waste. One time throw away that made fresh food go slimey and just added more plastic junk to the environment. Our bees and a love for the environment inspired us. After using our Bee Clever beeswax food wraps for a while we really fell in love with them and started making them for family and friends with hugely positive feedback and requests for more. Now we'd like to share them with you. 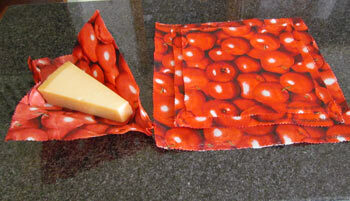 Use to cover any cut fruit or vegies, fresh herbs and vegetables, cheeses of all kinds. You can cover bowls to keep salad fresh or use to cover rising bread and pizza dough. It's also suitable for ferments, yoghurt, kefir etc. With lots of different designs, themes and colour schemes they look great on the table or at picnics and barbeques. 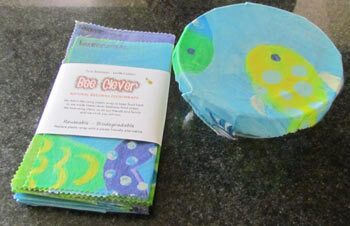 Virtually anywhere you use plastic wrap you can use a Bee Clever natural beeswax food wrap. Beeswax has natural antibacterial properties which help keep food fresh and discourage the growth of mould in a fully eco-friendly way. 100% biodegradable and compostable when worn out, there is no waste. Your wraps are easy to clean by just rinsing in cold water (and mild detergent if required), and with general use can last for months and months. It's such a good feeling not having a roll of plastic wrap in your pantry and not adding more waste to the landfills, plus a fun and decorative way of keeping your fresh food fresh. Brightens up any refrigerator or lunch box.